Historical bonds are not valid obligations. Even if they were valid obligations, they would not be payable in gold because gold clauses in bonds issued before 1977 are unenforceable in U.S. courts. Adams v. Burlington Northern R.R. Co., 80 F.3d 1377, 1380 (9th Cir. 1996)(26K TXT file, uploaded 9/28/98); 31 U.S.C. § 5118(d)(2) (2.5K TXT file, uploaded 9/28/98). While historical bonds often have the words “United States of America” printed on them, these references were merely to identify the bonds as issued by entities located in the United States. Nowhere on historical bonds are there any statements that the bonds are issued or backed by us or any other part of the United States Government. Only in limited and well-known circumstances have we guaranteed obligations issued by private parties, for example, the bonds issued by the Chrysler Corporation in the early 1980s. Lie: Historical bonds can be used in high-yield investment “trading program” sanctioned by any, some, or all the following entities: the International Chamber of Commerce (“ICC”), the IMF, the World Bank, the United Nations, the Federal Reserve Board, a Federal Reserve Bank, and the Treasury Department. Fact: There are no such “trading programs,” and none of these entities ever sanctions or regulates such private investment activity. For example, the IMF has issued a warning about financial schemes misusing its name. The scam artist’s use of humanitarian or infrastructure development theme is a trick to (1) make the investor want to believe that the trading programs are real and (2) make the investor believe that they could be helping a Third World country by forking over their money. Lie: Historical bond trading programs yield high rates of return through the buying and selling of “debenture” or “medium term notes” supposedly issued by “prime” or “top” European or “World” banks. This appears to be a recycling of the “prime bank” schemes that have long been labeled as bogus by countless domestic and foreign banking authorities. See, for example, the warnings issued about “prime bank” scams by the Federal Reserve Board, the Federal Reserve Bank of New York and the SEC. Courts have repeatedly held that prime bank trading programs, including those purporting to generate profits through the use of historical railroad bonds, are fictitious. See, e.g., SEC v. The Infinity Group, 993 F. Supp. 324 (E.D. Pa. 1998) (prime bank instruments described as “fantasy securities”)(28K TXT file, uploaded 9/28/98); SEC v. Lauer, < link to cclauer.txt> 52 F.3d 667, 670 (7th Cir. 1995) (such instruments “do not exist”)(12K TXT file, uploaded 10/5/98); SEC v. Daniel E. Schneider et al., No. 98-CV-14-D (D. Wyo. February 13, 1998) (order granting preliminary injunction; “prime bank trading schemes are fictitious according to readily available information”)(22K TXT file, uploaded 9/25/98). Historical bonds are worthless as securities. None of the historical United States railroad bonds are payable by today’s successor railroads such as CSX, Norfolk Southern and Union Pacific. Instead, historical bonds only have value as collector’s items. 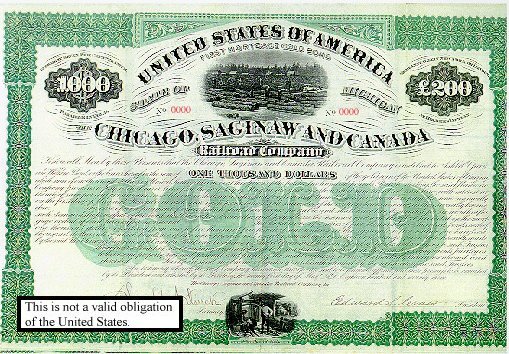 A 1995 publication, Stocks and Bonds of North American Railroads: Collectors Guide with Values (one of many available publications) assessed the collector’s value of the historical railroad bonds listed at between $25 and $700 each. Moreover, there are many sites on the Internet that you can visit to evaluate the collector’s value of any particular bond. Scam artists are selling historical bonds to unsophisticated investors at inflated prices far exceeding their fair value as collectibles. They often use third-party valuations, which state that the bonds are worth millions or billions of dollars each. These valuations or authentications, which are often referred to as “hypothecated” or “hypothetical,” are bogus. A typical valuation (104K JPG file, file uploaded 1/24/98) will falsely overstate the value of these bonds by assuming erroneously that, despite the unenforceability of the gold clauses contained in the bonds, and the defunct and bankrupt status of most of the bonds’ issuers, some person or entity is obligated to redeem the bonds in gold bullion. See SEC v. Gerald A. Dobbins et al., No. 98-229 (C.D. Cal. May 19, 1998) (findings on order to show cause re: preliminary injunction; valuations of historical bonds held to be “misstatements”)(8.5K TXT file, uploaded 9/25/98). CS&Cs creditors forced it into bankruptcy in 1876 and a predecessor of CSX Transportation, Inc. (“CSX”) purchased its assets. CSXs predecessor did not assume any of CS&Cs outstanding debt, including the railroad bonds. All claims to money due under the bonds, which had a face value of $1,000 each, were resolved 112 years ago in the 1876 bankruptcy proceeding. At that time, investors presented their bonds for payment out of funds from the foreclosure sale and received a distribution amounting to less than 25 cents on the dollar. After the bankruptcy proceeding, the bonds remained in court archives until they were discovered in the basement of a federal building. A museum in Grand Rapids, Michigan, packaged the bonds with other historical information about this railroad for sale as collector’s items for $29.95 each. Despite what a bogus valuation (104K JPG file, file uploaded 1/24/98) might claim about CS&C bonds, the bonds have no value other than as collectible memorabilia, since CSX has disclaimed any liability for redemption of these bonds, and they are most certainly not payable in gold. See Adams (26K TXT file, uploaded 9/28/98); 31 U.S.C. § 5118(d)(2) (2.5K TXT file, uploaded 9/28/98). Courts have held that the CS&C bonds have only nominal value as collectibles. See Schneider (22K TXT file, uploaded 9/25/98) (preliminary injunction entered against defendants; bonds have “no value, except that of a collectible”). Similarly, other courts have found that bonds issued in the 1800s by the East Alabama & Cincinnati Railroad Co. and the Marietta & Northern Georgia Railway lack any investment value. See SEC v. Dobbins (C.D. Cal. March 9, 1998) (complaint)(13K TXT file, uploaded 9/25/98); SEC v. Dobbins (C.D. Cal. May 19, 1998) (8.5K TXT file, uploaded 9/25/98) (findings on order to show cause re: preliminary injunction); SEC v. Dobbins (C.D. Cal. May 19, 1998) (preliminary injunction) (7.6K TXT file, uploaded 9/25/98); Infinity Group, 993 F. Supp. at 330(28K TXT file, uploaded 9/28/98).